As all primary school children know it is not possible to form crystals in a solution unless that solution is concentrated or super-saturated. The principle is the same in urine. It is unlikely that dilute urine will form stones. This is common sense. The children also know that in order to form crystals it is necessary to have a Nidus, such as a string, dangling in a glass of concentrated salt or sugar solution. Similarly, in the urinary tract, often a Nidus occurs and starts crystalline collection and aggregation, similar to a pearl forming in an oyster. The Nidus may be mucus or cellular debris. 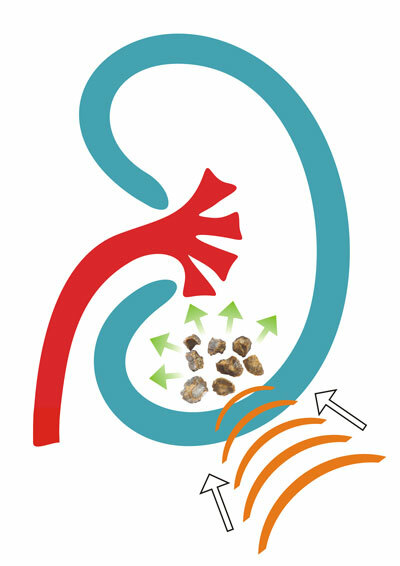 Records regarding kidney stones date back to Egyptian skeletons from over six thousand years ago. It is estimated that approximately 3-5% of the Australian population will develop urinary tract stones at some time during their lives. The classic presentation for a patient with a calculus is with “renal colic”. This is a severe pain which usually radiates from the loin to the groin region. It comes in waves, and characteristically the patient cannot find any position of comfort and paces the room. It is often accompanied by sweating, nausea and vomiting and may also be accompanied by burning urination and blood in the urine. Furthermore, the pain may radiate to the testis of the affected side in the male or to the labia in the female. Female patients who have had children will describe the pain as being worse than labour. 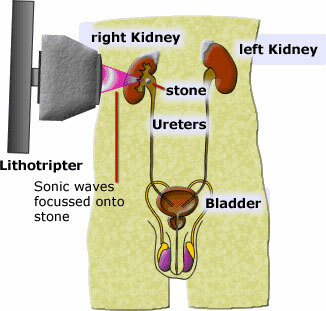 Ninety percent of stones within the kidney can be treated with Extracorporeal Shockwave Lithotripsy (ESWL). This is carried out with the patient sedated or under general anaesthesia. A shock wave (sound wave) is generated and focused on the stone. When the sound waves reverberate within the solid mass, after being transported through the aqueous medium of the tissues, the stone is caused to crack and shatter. Sometimes in a larger calculus (> 2cm), multiple treatments may be required if this is the elective procedure of choice. Approximately 5-10% of patients may require further intervention to remove fragments of calculi which become impacted within the ureter. Uretero-Renoscopy(Pyeloscopy) is an operation which is carried out using a flexible endoscopic instrument to visualise the inside of the ureter and kidney. The ureter is the tube which takes the urine from the kidney down to the bladder. It is usually carried out to extract or disintegrate and then extract stones which are blocking the ureter or located in the kidney. This procedure is usually carried out under general anaesthetic. That is, the patient is completely asleep. Sometimes the procedure may be carried out under regional anaesthesia where the patient is given an injection into a vein to induce drowsiness and another injection is placed in the patient’s back so that there is no feeling of pain below the waist. The patient may actually be awake for that type of anaesthetic. The procedure is usually carried out using the assistance from an x-ray machine called an image intensifier to help with indentifying the correct pathway through the ureter to the kidney and at the end of the procedure ensuring that urine passes freely to the bladder by injecting dye and watching it flow back down with the x-rays. The instrument is passed through the normal opening of the bladder (urethra) and then into the opening of the ureter where it may be passed over a very finely coiled spring called a guide wire. With manipulation it is advanced to the area of concern. If a stone requires extraction then a small wire basket may be passed down through the hollow opening of the instrument, the stone snared and subsequently extracted. Sometimes the stone is too big to extract by itself and it is necessary to break it up. This is carried out using an instrument called a Laser which is passed down the hollow sheath of the instrument and placed up against the stone. The laser breaks the stone into fragments less than 1mm in size. The fragments are usually small enough to pass by themselves with minimal discomfort. At the end of the procedure an x-ray (retrograde pyelogram) is carried out. This involves the injection of a contrast material into the collecting system of the kidney and ureter to ensure that there is free drainage back into the bladder and a stent is not required. 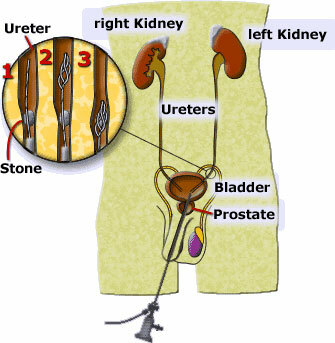 These stones are best managed by Ureteroscopy which is carried out by passage of the instrument into the bladder via the urethra and then into the ureter and onto the stone. In that position the stone may be grasped and moved. Alternatively, if the stone is too big it may be broken up using either Intracorporeal Lithotripsy or with laser. At the end of the procedure a Retrograde Pyelogram is carried out. If there is free flow of contrast back to the bladder, it may not be necessary to insert a stent. If the Urologist has any doubt about the ability of the kidney to drain, then a ureteric stent is usually inserted to allow the flow of urine through and around the stent. Bladder stones are usually associated with an enlarged prostate but sometimes also occur in female patients. 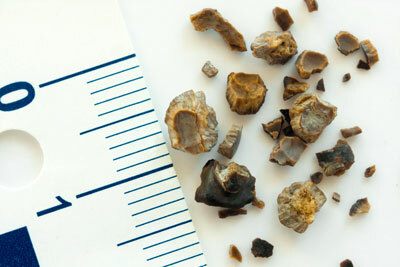 Most bladder stones can be removed with endoscopic instruments passed through the urethra. They usually need to be broken up with a mechanical instrument or Laser first. Some are too large. For example, >5cm and are more easily removed with "open surgery" where a small incision is made on the lower abdomen and the stone lifted out The wound is closed with sutures.The patient will have a catheter in place for approximately one week after the operation to help the bladder to heal.